I am fascinated by the oceans, I am a certified diver and try to check out our underwater world as often as I can. I definitely don’t get down there as much as I’d like, if only there was a way to visit, without so much of a commitment. Check out the Hydroview, an amazing remote controlled, underwater vehicle that actually records live video and takes photographs in full HD and then streams them straight to your iPad so you, and all your friends, can see deep under the sea, without any of you even getting wet. The Hydroview is of benefit to all levels of deep sea explorers, but it has some extremely practical uses as well, one can use the Hydroview to search for lost valuables, inspect anchors or boat hulls, actually study sea life, or inspect underwater cables or walls. It’s easy to “drive” your Hydroview via specialty software located on your iPad, android phone or laptop, whilst searching for mermaids or sunken treasures. The unit is extremely portable and has been designed by engineers who envisioned a vehicle that could “fly” through the water and provide us with some amazing scenes from the sea. The 8 pound 1 MP Hydroview has a 2 hour runtime and comes with a rechargeable battery, it moves forward at up to 5 knots with 1 knot in reverse. Hydroview comes with it’s standard 75 foot cable, LED lights, waterproof carrying case and the topside wi-fi box. Options include 150 foot and 300 foot cable lengths, hovering control, deluxe pontoon lights and an extended battery. 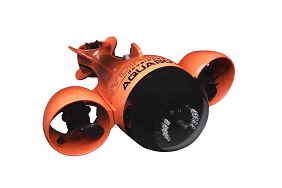 Hydroview is available at aquabotix.com for $3995.00 which seems a bit extravagant for the camera capabilities, although in checking out the sample videos posted on their website, the Hydroview could be a very valuable underwater tool, but what’s the justification on pricing. Does anyone know?